“Solo Me Muevo Por Dinero” (listen here) is the work of Spanish brothers Xeno and Tucho Baladon, known collectively as Xalan. The Euro disco duo released only two 12” singles, this and 1987’s Revolution Without Solution. The acquisitive, upwardly-mobile young urban professionals who became known as Yuppies in the early 1980s made their appearance in Spain at the tail end of an explosion of popular creativity—and during a rise in disposable income—that followed the death of military dictator Francisco Franco in 1975. And despite the euphoric trills and simple, driving melody, there is an audible undertone of melancholy in “pleasure unit” A-22PMF’s ode to its hedonistic lifestyle—perhaps the conflicting emotions of a culture that, in its rush for personal wealth, worried that (as the song’s lyrics attest) it no longer knew what emotions were. 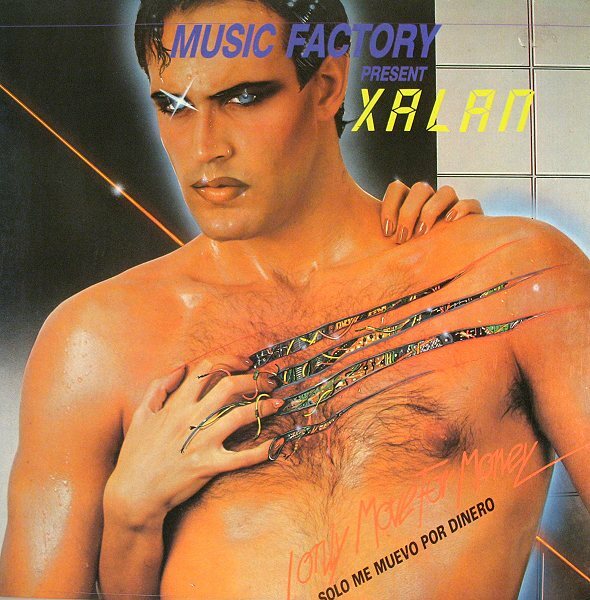 Released the same year as James Cameron’s The Terminator, the single’s cover art, by Lluis Diaz, features yet another ostensible human beneath whose skin lies only unfeeling circuitry, this one driven by money instead of violence.